What does it mean to be compassionate? Wikipedia describes compassion as a ‘profound human emotion prompted by the pain of others. More vigorous than empathy, the feeling commonly give rise to an active desire to alleviate another’s suffering.’ (1). My previous employer would implore us to show we care. To care is to feel concern for the welfare and protection of someone or something. That someone maybe our patients or our colleagues and that something maybe our employer or our profession. This is why we are a caring profession. To illustrate this theme however, I will use some of the more recent headline and controversial issues the profession has had to grapple with. For this to convey any real meaning at all, I will relate these issues to my personal circumstances. It is said that when you bring yourself to the table, you give others the opportunity to reflect on theirs and make the message even more powerful. After all, a recent BBC News report describes the level of compassion that NHS staff show to patients has deteriorated in recent years (2). As you may agree with me, compassion is key to quality healthcare. Every time I pack my bag to go to work, I neither plan nor wish to kill my patients through my actions or inactions. I am in the profession of making my patients gain the most out of their medication. However, I am also aware that mistakes are sometime inevitable. Until recently, I had worked it out in my head that if ever I inadvertently contributed to the death of my patient, I will pack it all in. Yes…quit my profession. The profession that I care deeply about! Of course, the recent suspended jail term passed down to Mrs Lee (3), is a poignant reminder of how important our role is as pharmacists. Faced with similar sets of circumstances, I would have acted in exactly the same manner as Mrs Lee. Every pharmacist I have spoken to about this case over the last few weeks and months, see a little bit of themselves in Mrs Lee: The arduous shifts and pressures at work. The common consensus was: It could be me! How then do we turn this fear into something more positive? The clues are all around us. When Mr Steve Churton, the Society’s president, launched the workplace pressure initiative (4), it signifies willingness from the top to listen to and act on the concerns of its members. I sincerely hope we will all take the opportunity to express any concerns we may have through the online survey (5). I am involved in a project about medicines use review (MUR). A group of us call ourselves MUR Evangelists. I bring this up because; MUR has been implicated in recent times as contributing to the problem of pressure at work. I only have to look at the letters to the PJ to see how divisive MUR has become. Whenever, I approach colleagues to become an MUR Evangelist, I almost invariable get this question: Does that mean I have to do MURs? No professional has to do anything! It is the feeling that we have to do something that has a significant bearing on the pressure we feel. And the pressure we feel leads to stress and we cannot practice effectively from a position of stress. What we are saying as MUR Evangelists is that you agree with the simple premise that MUR is right for our profession because of the benefits it has for our patients, our profession and other NHS stakeholders. I also know that, even as MUR Evangelist, it is impossible to deliver MUR in some pharmacies because the local pharmacy environment does not permit it. However, an MUR Evangelist will start to chip away at the barriers to delivering quality MUR by for example, motivating his staff (using a number of techniques) to embrace the service or addressing any delegation issues or acknowledging staff shortage issues. That said, there are some none negotiable standards that the profession impose on us. These are the things we have to do. These standards may change from time to time but we always hope that any such standards supports the foundation on which the profession is based and we get adequate support to implement them. Whenever, any none negotiable standards conflicts with our personal or moral standards, we can either act to change it or quit the profession. What we cannot do is nothing! So as an example, if you don’t do MURs, you can still practice as a pharmacist. However, if you do not keep your mandatory 9 Continuous Professional Development (CPD) records, then you cannot practice. Likewise, if you make a dispensing error and you do not have next steps in place to prevent future occurrence, then you are betraying another key foundation on which the profession is based: Safety of patient. I have heard of some pharmacists who show a blatant lack of remorse to dispensing errors. Anyone in this mould must re-consider their position as pharmacists. The individual’s right to self-determination. By refusing to supply, the pharmacist is tacitly imposing his/her religious belief on patient. Increased rate of unwanted pregnancy (which is currently a major problem amongst teenagers). Unwanted pregnancy can be a social burden and may increase depravity and child poverty??? When you ask us as to care, you are asking us to bring a little bit of ourselves to the table. For some it will mean simply being factual about the merits of one product over another, for others it will mean something different and more profound. However, the universal truth is that we bring with us our beliefs. After all, this is part of what makes us who we are. Showing genuine care is integral to delivering effective and quality care to our patients. We can only be genuine if we bring a little bit of what we believe to the table. If patient perceive that we are only paying lip service to this issue of care, we may be less successful in influencing their behaviour or attitude towards medication. I will illustrate this with a number of examples but I sure hope that as pharmacists we believe fundamentally that medicines, when used properly, are important in our attempts to prevent and fight a host of diseases. I also hope that, as professionals, we will always stay objective and resist our judgment being clouded by our beliefs (a tough call I know!). A really good example to illustrate my point will be the issue of whether to dispense or not to dispense emergency hormonal contraception (EHC). This has and will always inflame a lot of passion because the belief system in play here relates to the issue of faith. There are pharmacists who will quite happily dispense EHC and others who will not. A reason why this issue is so divisive is because most of these pharmacists care and they do so with passion. Like the MUR example above, you can still practice your profession if you do not wish to dispense EHC as long as you signpost the patient to another pharmacist or service provider who can. At that point we may explain to the patient why we cannot supply the EHC. When this is done properly, most patients will thank us for our candour. There are very powerful arguments on both sides of the EHC debate and table 1 describes a few of these. I am, for the record, quite happy to supply EHC. 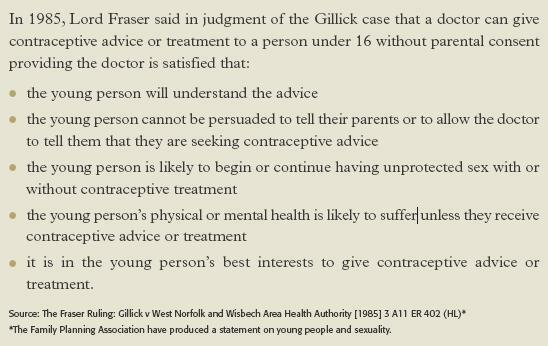 If I however consider Lord Fraser’s ruling in 1985 (box 1), then theoretically, I may be called upon to dispense EHC to a 10, 9 year old or even younger patients, if they tick all the right boxes. I know that I will be uncomfortable with that so I wouldn’t. I do not feel my training has equipped me to make judgments using the Fraser parameters on someone as young as that. Even if I had the right skills, I will still be reticent (although, this is yet to be tested). But how low below the age of 16 will I go? I have had to dispense EHC to a 15 year-old who met the Fraser parameters but it wasn’t a comfortable experience. I channeled by discomfort to making sure the patients understood the advice whilst re-enforcing that her interests were best served with parental consent. I will be very surprise if a pharmacist is happy to dispense EHC to a 9 year old without any feeling of discomfort. Why then are we wrestling with these moral issues anyway? Could it be because we care? Pharmacy is not unique in this regard. There is the widely reported case of the nurse from Somerset who was suspended for offering prayer to one of her elderly patients (6). The nurse was later reinstated (7). I don’t think our profession will suffer from members who care about the profession and their patients. I however think we will have problems with members who don’t. I touched on this in my ‘Case for Community Pharmacy’ published on the Transition Committee blog (8) and all our projects are now geared towards recognising those who show great passion in our profession. Our profession is undoubtedly compassionate and is a reflection of the compassion of its members. We need to demonstrate that compassion without imposing our beliefs on others. When the Society calls for decriminalisation of dispensing errors (9) and Steve Churton wrote ‘Many will question why the sentence imposed was so severe’, I think what he is affirming is that the sentence handed out to Mrs Lee was disproportionate. I think that should comfort Mrs Lee. A patient has died and the family’s grief in this case cannot be discounted even though it was apparent that the cause of death was not related to the dispensing error (10). I have reflected greatly on this and put myself in Mrs Lee’s shoes. Before this case I would have stopped practicing as a pharmacist. I have since changed my mind. I will serve the sentence imposed on me by the court, learn any lessons and return to work as a pharmacist. Why? My profession needs me. I sincerely hope commonsense will prevail in this case and pharmacists will be allowed to continue to make a difference in their local communities without a looming fear of prosecution. We care passionately about our patients and their welfare and we impose high internal standards on ourselves to make sure we continue to deliver high quality pharmaceutical services. And by the way, we also like to be quietly efficient and retiring about it.